This reading recounts some of Jesus’s final words. Jesus is close to the end of his ministry. He knows that within a short time he will be facing his death on the cross. He knows the impact this will have on his followers. So Jesus says the words that will provide solace not only to his living followers but also to millions of followers who are yet to be born. 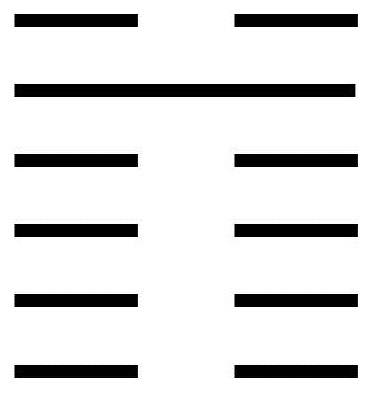 This hexagram is made up of the same two trigrams as The Army (archetype 7), but now the trigrams are reversed. Water is now above the earth, symbolically representing the ocean, that place where all rivers meet and become one. To unite with others, and through that union to complement and help one another. To form that union around a central respected person. To recognize the responsibility held by the central figure and the need for tremendous spirit, consistency, and strength. To have the humility not to take on the responsibility of guiding unless one is truly equal to the undertaking. To recognize the risk of chaos if a poor leader is chosen. To understand the importance of timing, for while a strong union attracts the uncommitted, newcomers lack the shared experiences that bond others. To understand that the strength of the union depends on the purpose and meaning each of the members find in the union. A moving line in the bottom position reminds us that sincerity and truthfulness are the foundations of relationships. This attitude shows itself not in fancy talk but through calm inner strength grounded in Wisdom. This strength creates a magnetism that seems to attract blessings from the universe. A moving line in the second position tells us the way to respond to God’s call is with dedication and inner conviction. This creates an inner peace and dignity that fosters positive relationships with others. Relationships driven by the hope of gain are grounded in Ego, not God. These relationships will bear poor fruit. A moving line in the third position shows how to deal with the inevitable company of those who do not follow Wisdom’s way. At such times, we must be careful not to be drawn back into our old patterns. We can’t avoid people of darkness, so the best approach is to be social without being intimate. True intimacy must be reserved for those whose path we share. A moving line in the fourth position is positive. The relationship with the one who holds the union together is now well established. It is right and proper to be open about our dedication. We must remain constant in our dedication and not allow ourselves to be led astray. A moving line in the fifth position depicts one of great influence. Some are attracted, some are not. It is their choice. No threats are necessary. Opinions can be expressed. Those who are meant to be part of the union will stay; those who aren’t won’t. A moving line in the top position counsels care in the beginning. Every journey begins with a single first step. If one missteps in the beginning, there is little hope of correcting the path later. When building a union, complete and full devotion are needed from the beginning. If that opportunity is missed, by the time the error is realized it will be too late.